New York Comic Con is upon us and, as usual, its aisles are filled with all kinds of nerdy merchandise and collectables. A few of our favorite poster producers are also there, and we’ve got just a handful of their offerings to share in case you can’t make it to NYC to check them out. First up, here’s not even half of what’s on offer from the Bottleneck Gallery, which is at booth #2160. Matt Ferguson’s Jurassic Park. A variant is also available. Martin Ansin’s Batman Beyond. Variant at NYCC, regular online. Karl Fitzgerald’s Return of the Jedi. A variant is also available. Gabz’ Blade Runner. A variant is also available. Ise Ananphada’s The Two Towers. A variant is also available. Laurent Durieux’s E.T. A variant is also available. Matthew Peak’s Halloween 2. A variant is also available. Dave Perillo’s Rick and Morty. A variant is also available. Rockin Jelly Bean’s Guardians of the Galaxy. A variant is also available. Tom Whalen’s Superman the Animated Series. A variant is also available. And here’s a bunch of stuff from Grey Matter Art, who are at booth #3064. 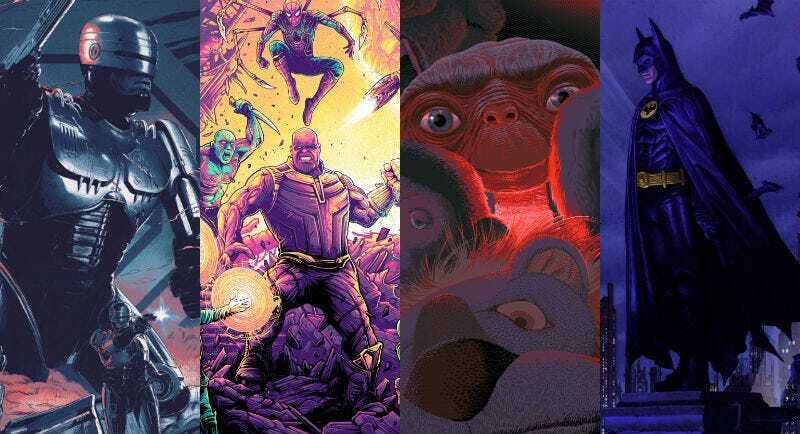 Avengers: Infinity War by Dan Mumford. Variants are also available. Carnage by Andy Fairhurst. Venom is also available. Black Panther by Tom Whalen. A variant is also available. Thor Ragnarok by Matt Ferguson. Variants are also available. The Hero Complex Gallery is also in attendance at booth #228, as well as favorites like Jason Edmiston (booth #574 in the Block), Anthony Petrie and Ian Glaubinger (booth #847 in the Block), Tom Whalen and Dave Perillo (booth #983 in the Block), and many, many more.